Sunday school 12 pack, especially popular with the older children. Approximately 20cm in length, made of nylon with a plastic clasp. Great value at less than 22p a bracelet. 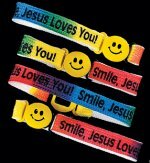 Sunday School 12 Pack of "Smile Jesus Loves You" Bracelets. 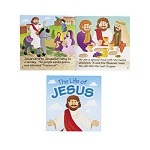 Great little gifts for Sunday Schools and Bible classes. Made of strong fabric with a smiley face clasp, these bracelets are popular with all ages. Christian 12 pack of pencils. 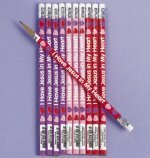 These pencils are perfect for Sunday school gifts and can be matched with other christian gifts. They come in three colours and are a popular choice. Bright Cross Necklaces. 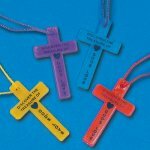 Each of these 6cm plastic crosses comes on a 60cm matching cord. The message on the cross says "Discover the Treasure of God's Love." 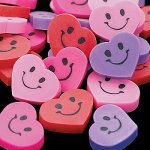 Ideal for goody bags, for fund raising or simple gifts for young children. 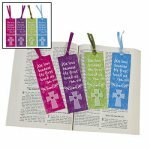 Sunday School 24 Pack of Ten Commandments Bookmarks Ideal gifts in Sunday Schools, Bible Classes and schools.Made of strong card with ribbon, these bookmarks are popular with children and adults alike. Excellent value at less than 10p for each bookmark. Pack of 4 fun Badges for Croc Shoes. These make ideal gifts for teenagers and children. Great for the Summer: fun to wear with colourful designs and the Message of God. Mega Pack of Books of the Bible Bookmarks. 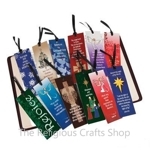 These bookmarks make ideal gifts in Sunday Schools and other church groups. Each bookmark lists all of the Books of the Old and New Testament in sequence. Great Value Price - only 9p each. Sunday School Pack of 24 Cross Bookmarks. These bookmarks make great little gifts for children and adults alike. Made of strong, glossy card measuring 13cm, with the indent to bookmark the special page. There are 4 colours in each pack. Great Value at less than 10p for each bookmark. Christmas Pack of 60 Tattoos. This is an ideal fund raising pack for Christmas or for giving out in Sunday Schools. Tattoos measure approx 3cm. Easy to apply and remove. Sunday School Book of 'The Life of Jesus'. This is a lovely book to give to younger children in Sunday School. Each book has 12 pages with colourful and glossy illustrations. There are simple sentences for younger children to read. Books measure approximately 13cm. Jesus Loves Me Pencil. 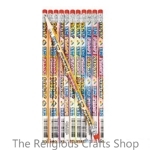 These colourful Christian pencils are always popular with children. Pencils come in a range of bright colours with the bold logo 'Jesus Loves Me'. 1 Dove of Peace Brooch. 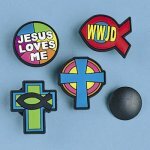 These brooches are a simple and elegant Christian symbol of peace. The dove is a classic design with a metal surround and enamel white centre. Dove measures 2cm. 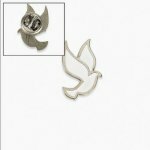 These brooches are a perfect match with our Dove of Peace necklaces. Sunday School 12 pack. 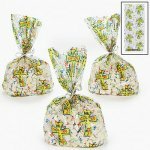 These cellophane gift bags are ideal for filling with Christian gifts and goodies. They measure approximately 27cm by 14cm. 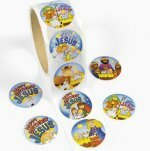 Sunday School pack of 50 stickers. Perfect for celebrating Christmas. 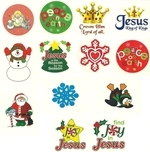 Children can use them to decorate cards, envelopes, seal gifts, Christmas and Nativity activities. Stickers measure 4cm. 12 pack of Happy Birthday Jesus paper bags. 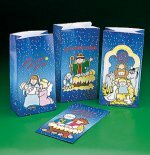 Very popular at Christmas for packaging christian gifts in Sunday schools and schools. They measure approximately 25cm by 12 cm - lots of room for books and gifts. Christmas Themed Bookmark. Great value gifts with an inspirational message. There are variety of bright designs and religious messages. Bookmarks measure 5cm by 15cm and are made of strong card with a black ribbon. 1 Advent Build a Scene Sticker Calendar. This is a beautiful and symbolic calendar to celebrate Advent and the true meaning of Christmas. Instead of aspiring for a small chocolate, children can day by day place a sticker on the calendar to build up the Nativity scene. 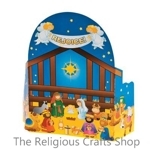 Each day they recreate the Nativity and have a lovely finished scene to treasure.Each pack has a 3D card background with a sheet of 25 stickers. The card background has two sides - one with numbered places to stick each sticker: the other side is open ended to allow older children the chance to create their own scene. Calendar measures 28cm by 21cm.